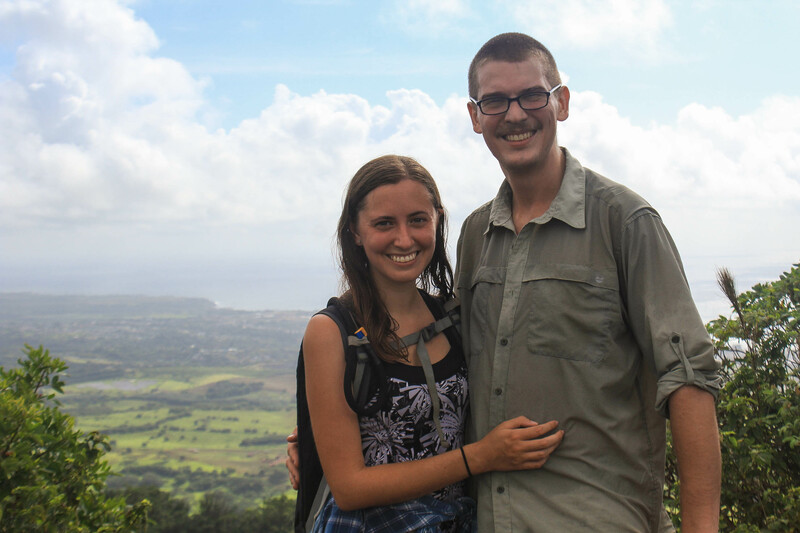 We wanted to begin our time on Kauai with a short, easy hike that would give us good views of the island, and Nounou Mountain was the perfect choice. The trailhead begins relatively close to the airport so we were able to arrive early and get a head start on our day. There are three different approaches listed on Alltrails: one trail from the East, one from the West, and one that started way to the South. The Western trail was shorter and steeper at about 2 miles long while the Eastern one appeared to have more switchbacks and was 4 miles long, and the Southern one looked like it just wandered around the mountain before meeting up with the Western trail. 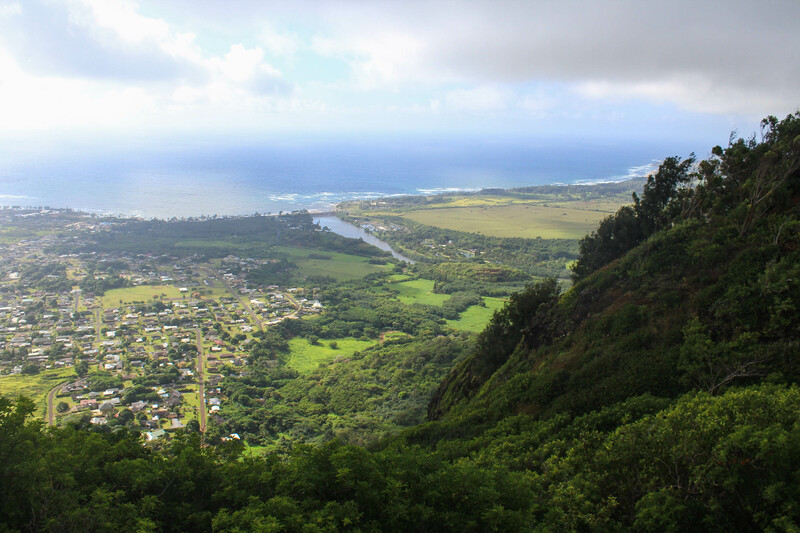 We chose the Eastern trail, with the trailhead located off of Haleilio Road in Wailua. It’s located towards the end of a neighborhood with a small parking lot at the trailhead. 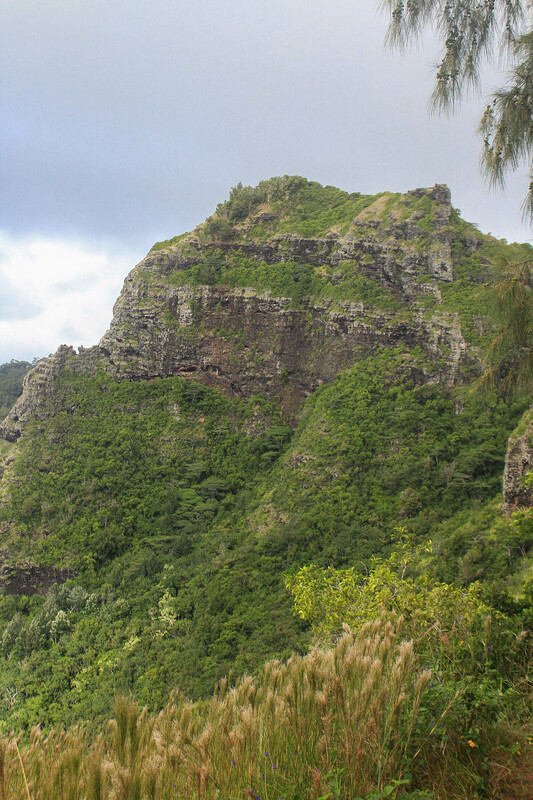 It isn’t very often that we come across trails with switchbacks on the islands, and this one was very well maintained and enjoyable. It appears that not everyone shares our affinity for switchbacks though as there were many worn paths cutting off the trail. However, we stuck to the main trail and loved the easy, gradual ascent. Most of the trail is shaded, but there are windows between the trees showing off little views of the surrounding area, and they got better and better as we climbed higher. As we stopped to take in the views and catch our breath, I gazed out over the different mountain ranges and thought to myself, I have no idea what those mountains are called. I realized that it had been too long since I experienced that feeling of total newness and unfamiliarity. 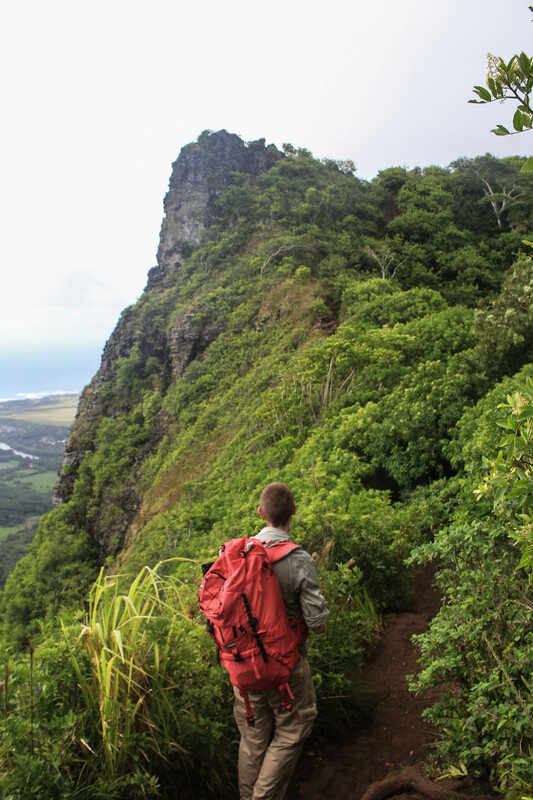 Hiking new trails to different peaks on Oahu can be interesting as we gain new perspectives on our familiar island, but regardless of where we are we can name the other ridges, significant peaks, or other points of interest nearby. Here, every peak was a stranger, and I constantly had to stop and get my bearings. I miss that feeling. We reached the wide grassy area with picnic tables and a shelter, but didn’t stay here long. The trail continues down a more narrow path to reach the summit. Supposedly there used to be a “Do not go beyond sign” sign here to prevent people from climbing higher, but it wasn’t there so we continued. Ending the hike at the picnic tables would be rather anti-climatic as the view is obscured here. Near the end of the trail is the steepest park with a little rock scramble, which we carefully climbed up and were rewarded with unobstructed views. First we took the trail to the right, hiking up to the summit itself. 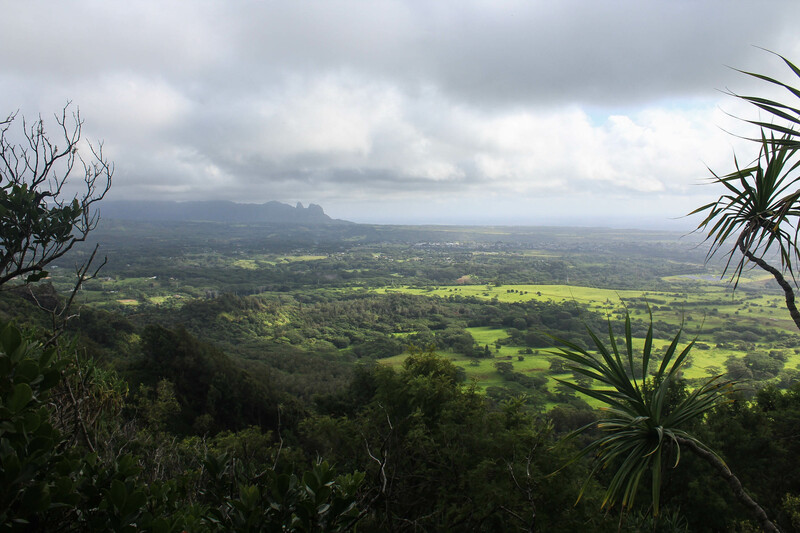 It was windy and overcast with clouds hiding the higher peaks at the center of the island from our view, but this really gave us a great perspective of Eastern Kauai. I had never seen pictures or studied maps of this area, so I loved just wandering around the summit soaking up each view. It felt like we were as high as the other peaks we were looking at, but later when studying a topographic map I realized just how much lower this peak actually is. Regardless, this peak is absolutely worth hiking. Our trip was off to a great start!